In her new pink shoes. 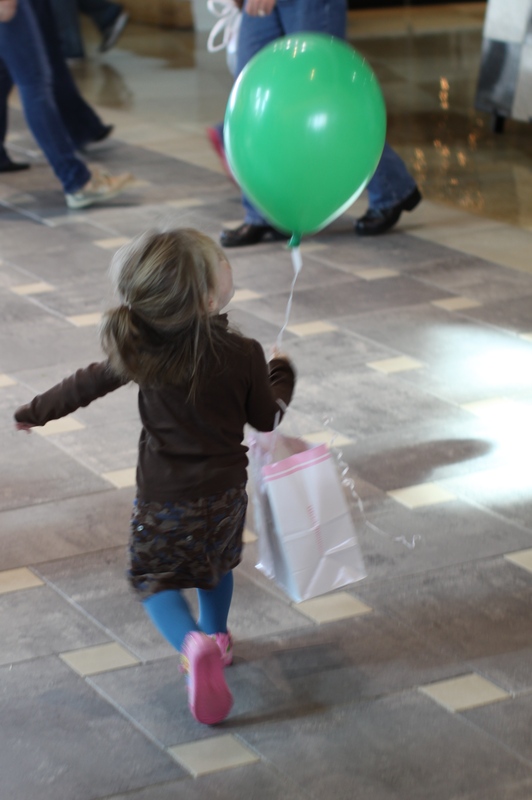 She loved her green balloon. Steve drove me home from the Poetry Reading at Borders. Drove around the block so I could shoot the Halloween House and the FULL moon. Got out of the car and it wasn’t looking like much. Then the traffic started to arrive. And the lights of the passing cars added some interest. But when the 25 bicycles sped by with their lights on I shot as fast as I could. Not intending an animation initially but I thought it made the series worthy of publication. Walking into the room this morning I saw the oak tree catch the morning sun, reflect it onto the art room tables. Warm fire aglow. A stunning welcome to the beginning of the work day. I dialed the combination to get the camera out of my locker. 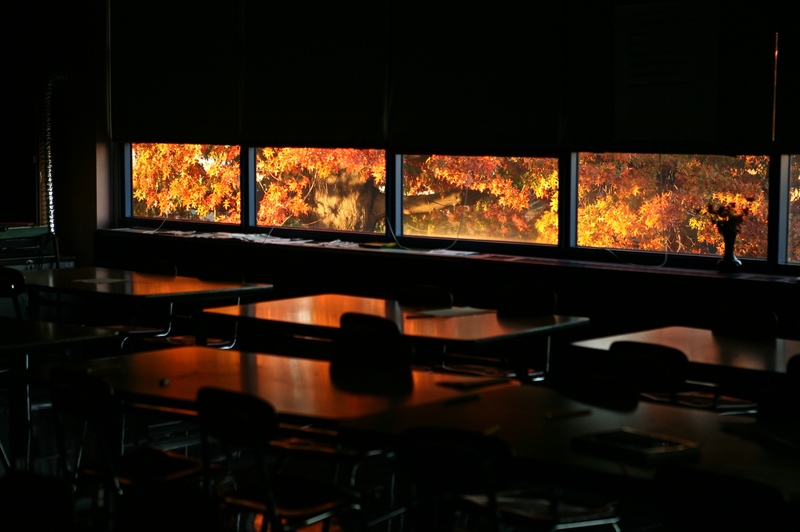 Autumn colors at their peak, through the art room windows. Driving from one school to the other in the middle of the day, stopped at the red light. 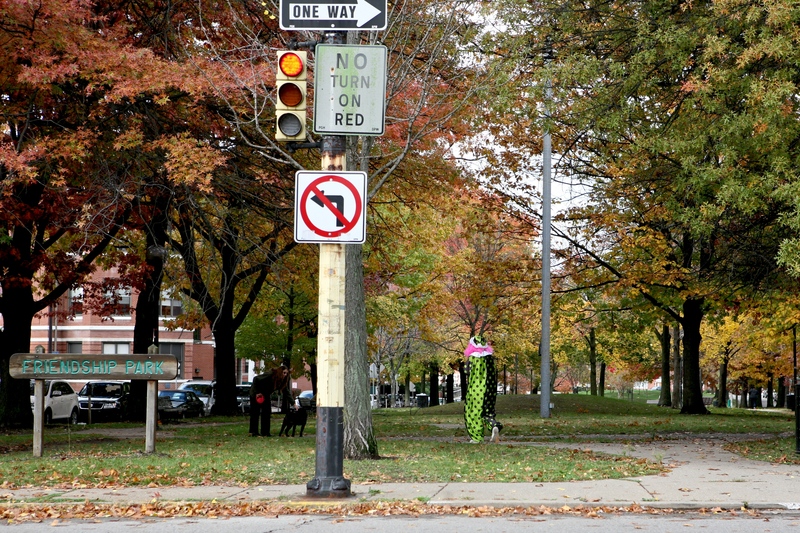 You just never know what you will encounter. Near West Penn Hospital. Wonder what the dog is thinking? It was all candles. Candles on the mantel, the table, the desk in the hall. It was very dark. I thought all of us looked great by candlelight. We discussed The Help and The Girl with the Dragon Tattoo. The power was off for about two hours. Fortunately the night before I baked a Gateau di Sirop (recipe)with a bottle of Steen’s Cane Syrup. Baked Split Second Cookies with Bon Maman Fig Jam. Extra sharp cheddar and Honeycrisp apple slices. 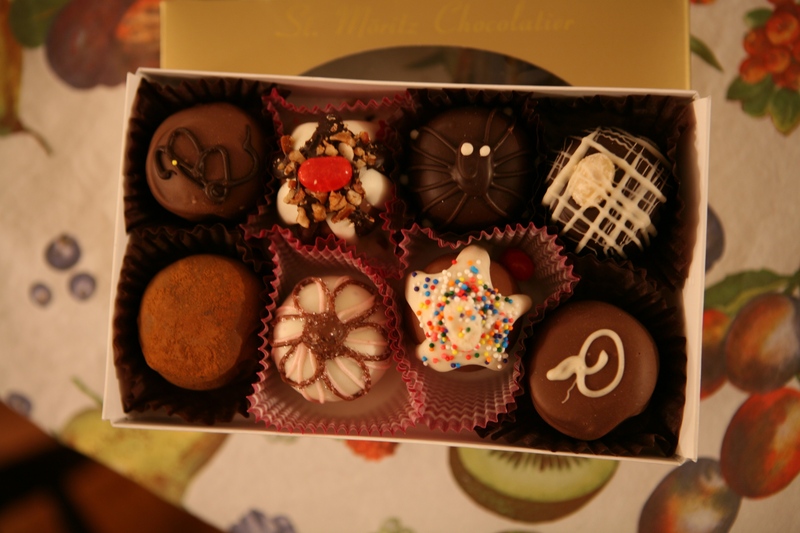 And Tess and Chris brought me a box of St. Moritz truffles from Oxford Centre downtown. Lovely. A gold box with an oval window in the middle. There’s a spider and a tiny dancer one and a pumpkin one and each one is delicately embellished. Just before everyone arrived, Laura had sent a picture on my phone of a lovely ring on a finger. Then she called. James Weaver asked her to marry him and she said YES. It was a happy night! 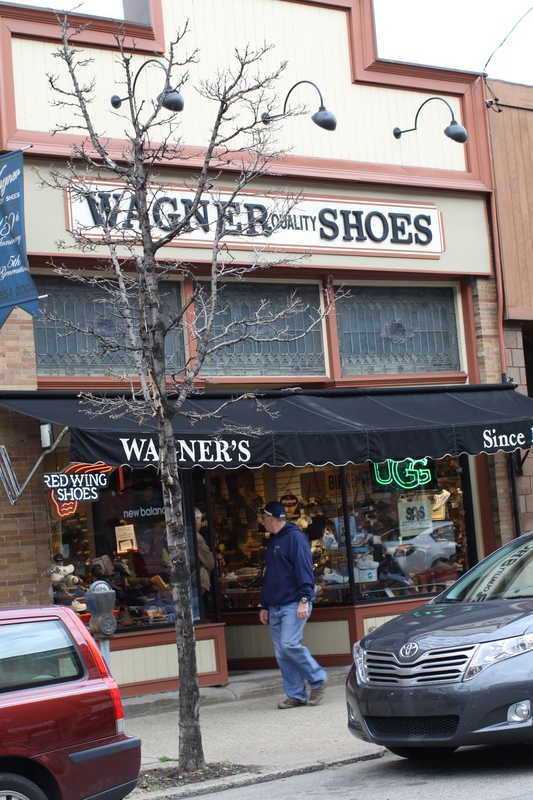 Wagner’s Shoes in Lawrenceville. I bought discontinued Dansko clogs on sale. You know how I like to live in them all the time. Seems most shoe salespeople in shoestores disappear into the back and magically reappear with boxes. 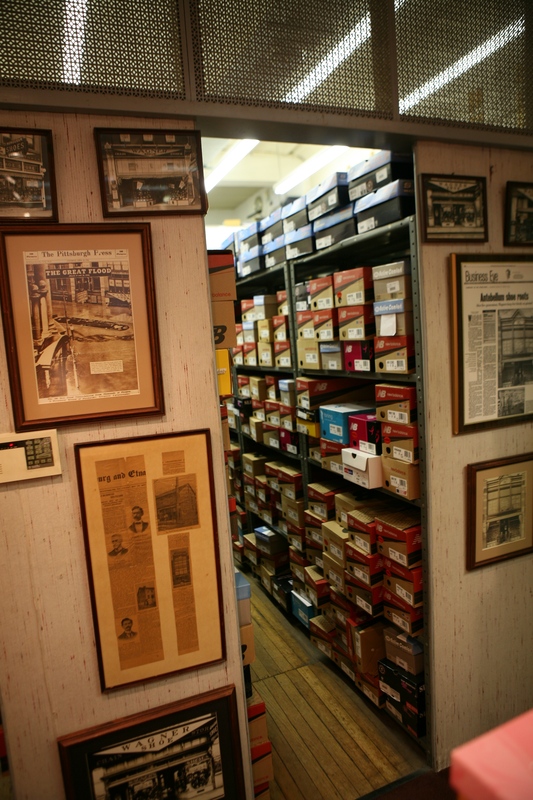 Here you can see the storeroom with the stacks of shoe boxes, right there. A tin ceiling way high. First time to shop in Wagner’s. The storefront has stained glass above the awning. Great service. 4313 Butler St (412) 682-2759. Scroll down for exterior view. Check out the newspaper clippings. 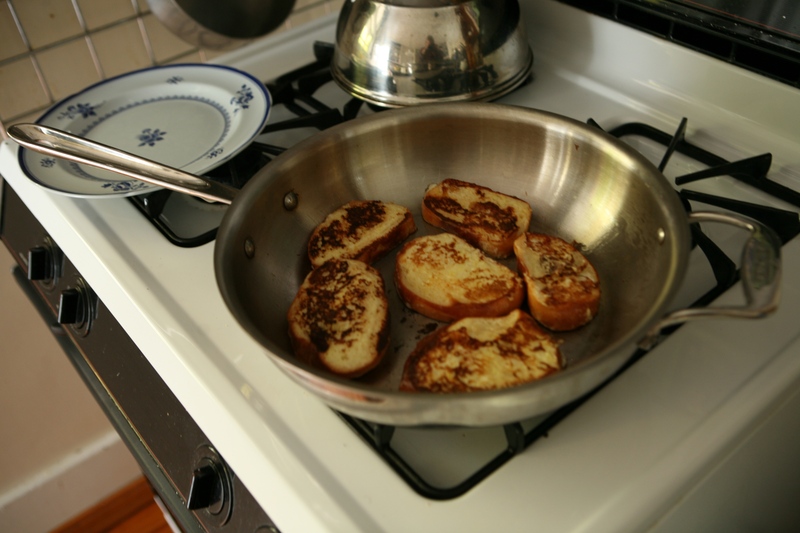 Talking to my sister(NYC) Sunday morning I asked her the best way to warm the brioche from Saturday. 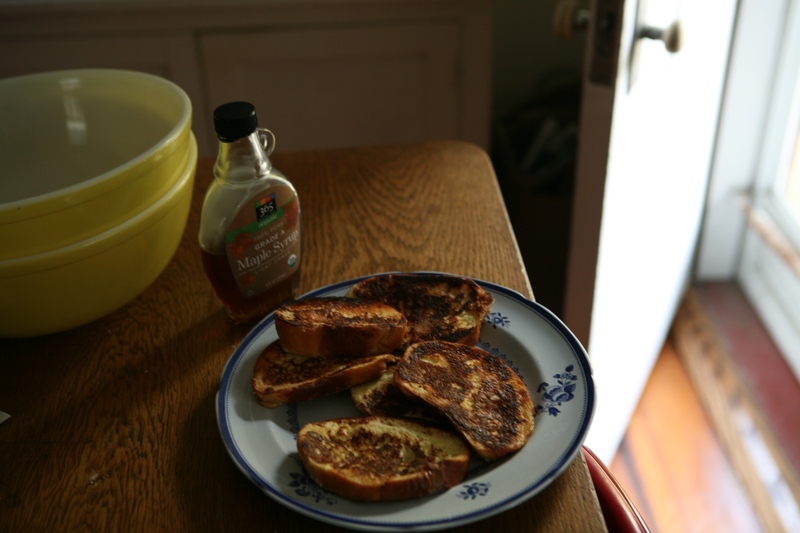 She responded French Toast! and so while we talked on speakerphone I made it and it was so good. Had never made it out of brioche before although have seen it on a menu. Soak. Saute in heavy pan with a bit of butter and oil. Eat with warmed maple syrup or jam. Slice and soak in egg and milk mixture. Crossed the Allegheny River to go to Millvale. After I went to Panza’s to pick up Joan’s painting I had reframed, I went to get some brioche and a loaf of crusty bread from Jean-Marc Chatellier’s French Bakery. 412.821.8533 Everything in the bakery is beyond delicious. 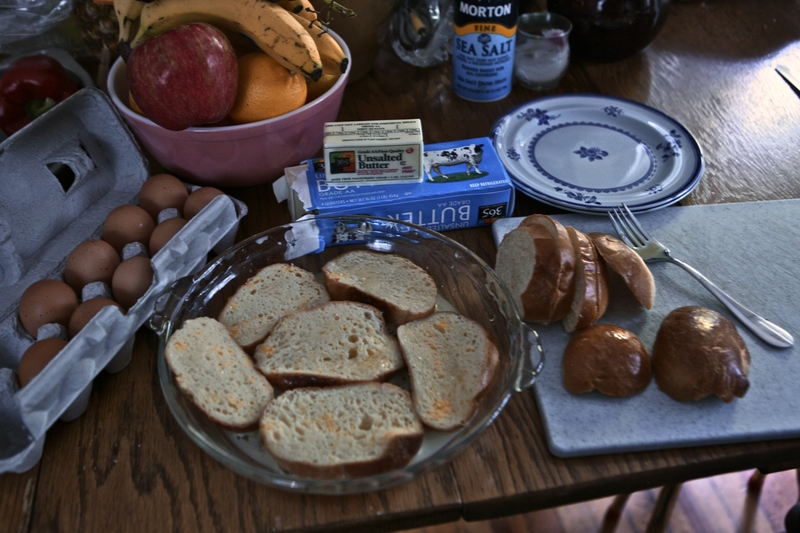 There are samples on the counter of the melt-in-your-mouth butter cookies and a French shortbread called Breton Cake. There are little fruit tarts, apricot tarts and flaky croissants, even Key Lime pie slices. 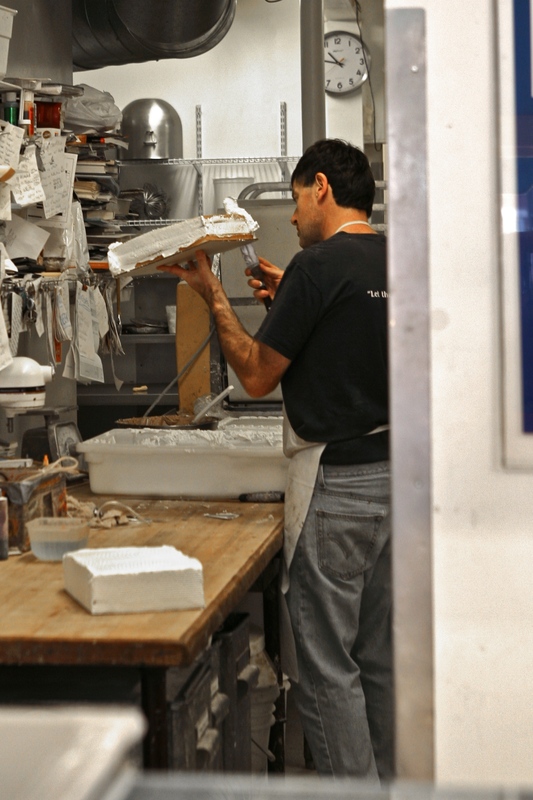 As I was about to pay for my order, I saw him frosting a cake in the back. I asked the young woman waiting on me if it would be all right to take a picture. She said,” Just take it!” So I did. Magnificent artistry in cake making. And delicious. I have eaten memorable wedding cakes made by him. Once I bought a cake there for Laura’s graduation from Marquette and drove it to Milwaukee WI. Memo to self: Drive across river more often to Millvale and buy delicious pastries from Jean-Marc Chatellier. It’s dark in the morning on the way to school and you know how I like to shoot at red lights. Saw the Cathedral peeking through the driveway as I looked to the left out the driver’s window. Then when I got to school in Arlington the sun was coming up and I could see the Cathedral in the distance. The school buses lined up, waiting to let the children get off to go inside for breakfast.